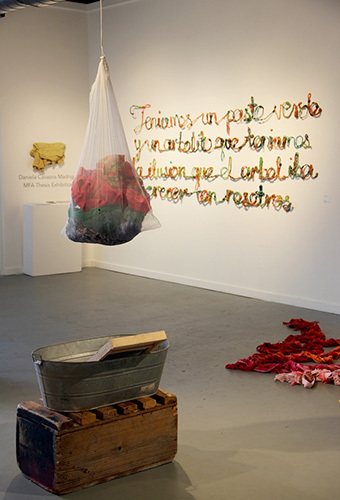 Daniela Cavazos Madrigal's MFA Thesis Exhibition is going on this month at UTSA Terminal 136. (May 10, 2017) -- Daniela Cavazos Madrigal, a graduate student in the top-tier Master's of Fine Arts program at The University of Texas at San Antonio (UTSA), is using clothes to share stories about the American dream and immigrant experience in the United States. Madrigal, a Laredo native, uses clothes that have been thrown away or recycled. She gets the clothes from "ropas" or large warehouses in Laredo that sell clothing by the pound. "You go in and see mountains of clothes, and it made me think, 'Where did they come from and who wore them?'" said Madrigal. "I gave those materials new life by repurposing them and transforming them to honor the traditions of women's work." Madrigal said quotes or verses stitched on jackets and shirts come from the accounts of her undocumented immigrant friend. Some of the text remains in Spanish, while some is translated. She said she hopes her exhibition inspires those who see it to have a productive dialogue about immigration. "The political climate that exists after the election and the deportations going on are issues I wanted to address through these verses on unconventional materials," said Madrigal. The MFA thesis exhibition, "I came from wet", is open to the public at UTSA Terminal 136 in the Blue Star Arts Complex through May 20. This spring, Madrigal will complete her graduate degree, with a concentration in painting and drawing, and hopes to continue highlighting issues facing the Latino community with her work. She said she already has other exhibitions lined up in San Antonio and Austin. Madrigal said the opportunity to showcase her work during several exhibitions at UTSA and San Antonio and learning from top-tier faculty, many of who are professional working artists, have helped her become a better artist. "Christie Blizard, an assistant professor of art at UTSA, is very active in the art community. She encouraged me to step out of my comfort zone and I was able to produce better work because of her instruction," said Madrigal. The UTSA Master's of Fine Arts program is accredited by the National Association of Schools of Art and Design. Specializations are offered in painting/drawing, printmaking, photography, new media, sculpture and ceramics, taught by faculty members who are practicing artists. The department hosts a number of visiting artists, curators and critics each semester who are invited to participate in studio visits. The visit give UTSA graduate students a chance to network and identify opportunities to showcase their work in San Antonio and other large cities across the nation. Learn more about the MFA Thesis Exhibition. Learn more about the UTSA Department of Art & Art History.